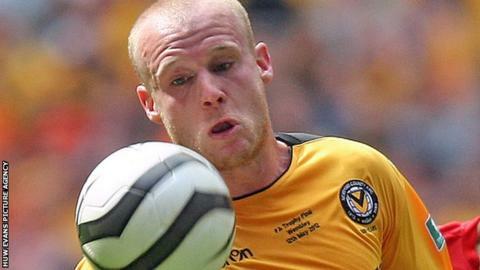 Lee Minshull's double helped Newport climb to within two points of Blue Square Bet Premier leaders Grimsby. Minshull struck twice in 15 first-half minutes, first with a header from Andy Sandell's cross and then from close range after Byron Anthony hit the post. Anthony added the third from the edge of the area before Gavin McCallum's half-volley maintained Woking's record of scoring in each home league match. Newport stayed fourth after equalling their best away win of the season. The home side went into the match with six wins from their last seven games, but rarely troubled the visitors, especially after midfielder Billy Knott had hobbled off early on. "We defended sloppy today and didn't pick up the second balls in the first 20 minutes. It wasn't a case that there was pressure in the game; we got done by sloppy goals. "(The injured Billy Knott) is a big player to us, he's been different class and he had already opened them up two or three times. "It wasn't our day. We've had a great run and we came into today very confident, it was just mistakes that got punished." "It was an excellent performance and a very good week for us with two fantastic wins. "The only disappointing aspect is that we've conceded one at the death but I thought, again, we were efficient without being spectacular. "Once we got that third goal I was confident we'd see the game through."